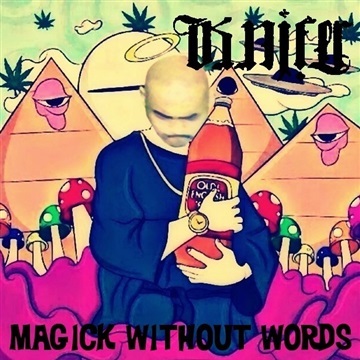 Magick Without Words is the second studio album by American rapper Knifer, released April 20, 2015 under A Dark Philosophy Records and distributed by Universal Music. It is the follow-up to his debut album Me Against The World (2014). The album's production was primarily handled by frequent collaborator B-Rae, along with production from Louden Beats and DJ Clueless and features several guest contributions from fellow American rappers such as WC, AV LMKR, Honey Cocaine, Rittz, Flesh-N-Bone, Davina and among others. Magick Without Words exhibits an expansion on his debut's G-funk sound and contains gangsta rap themes such as violence, promiscuity, drug use, street gangs, and crime. Despite mixed criticism toward its gangster-themed lyrics, Magick Without Words received general acclaim from music critics for being a charity album. Track 20 features the Underground Rap All-Stars which includes AV LMKR, Warga, BAM-bam The Voodoo Chi7d, Lonna Marie, Honey Cocaine, Knifer, Dizzy Wright, 1AM, Rittz, Grizz Lee, B. Rae, @Eaze, Raw-Logic, Flesh-N-Bone, Recklezz, Midnight Grahmmer, X-Raided's Mr. Lil Man, Yung Dree, Steve Lenin, Flowhammad, Tendency, Javon Johnson, Terisa Siagatonu & Élan Noelle. Track 19 was written by Michael Shane Margolin (The Mad Poet).